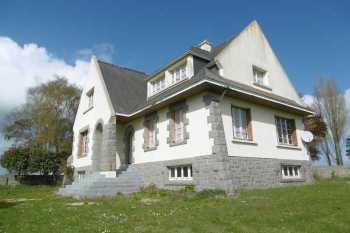 Properties for sale in Brittany, France - AHIB-1-PO-083 Paimpol 22500 Detached 5 bedrooms house with superb views and 6 minutes from the sea. An attractive south facing Breton house set in approximately 2000m2 of garden with superb views. Stone arch entrance, tiled hall way, recently refurbished kitchen/breakfast room. spacious lounge. Separate dinning room. Downstairs bedroom, bathroom and WC. Upstairs via a wooden staircase to 3 double bedrooms, a small single bedroom/study with the possibility to extend into the storage area. Shower room and separate WC. Further large storage space that could be converted to a further bedroom or en suite facilities. Below stairs a huge cellar - the footprint of the house, comprising a 60m2 garage area, laundry room and a further storage area. Oil fired central heating with radiators in all principal rooms. In addition there is a detached single garage at the rear of the garden. The house is situated between lesardrieux and Paimpol. A few minutes from the coast and all amenities. Approx 80 minutes from St Malo and about the same to Roscoff. The house offers approximately 250m2 of usable space and would make a perfect family home. There is some updating and decorating required. This is reflected in the asking price. However the location and views make this a rare find and an ideal place to live. in addition there is the possibly to offer B & B accommodation if one is looking to derive an income. The surrounding pink granite coast, sand beaches and towns are a very popular tourist destination.